Yesterday marked the 50th anniversary of the opening of the Rootes Factory in Linwood that made the Hillman Imp. To accomodate the workforce, the small industrial village of Linwood was expanded and the first “Regional Shopping Centre” in Scotland was opened in the town centre. 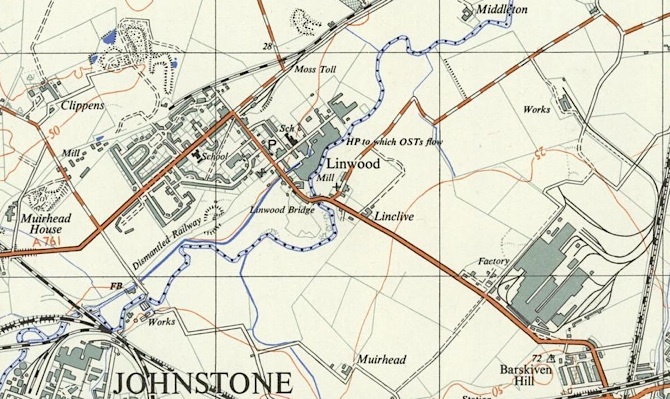 Land in Linwood had been acquired for development in 1930 by the Parish Council of Kilbarchan. But with the new factory, a major expansion was required. So in 1965, land for the new Regional Shopping Centre was assembled by the County Council of Renfrew under the Linwood Compulsory Order 1965. 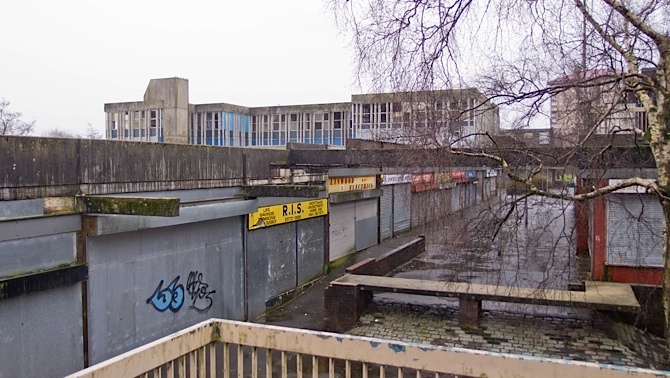 In 1967 this land was leased by the County Council of the County of Renfrew to a company called City Wall Properties (Scotland) Ltd. for development as a shopping centre on a 125 year lease (expiring in 2092). For twenty years, Linwood, its residents and its shopping centre thrived. Then, in 1981, the car plant closed its doors with the loss of 6000 direct jobs and a further 7000 in the wider economy. The community entered a period of catastrophic decline with families leaving and emigrating. 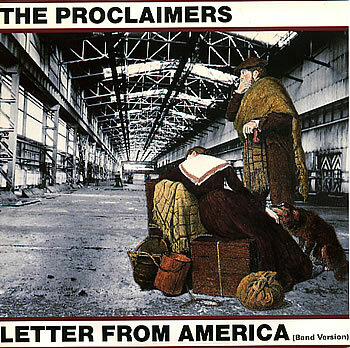 Linwood was immortalised by the Proclaimers in Letter from America, their 1987 ballad of emigration and economic decline. Mary Bowman, 63, moved to Linwood 40 years ago and watched as the town went from boom to bust. “People just left,” she said. “They closed two primary schools because the population dwindled away. The town had 30 shops. “We had a Woolworths, two bakers, a cafe, video shops, a supermarket as well as Clydesdale Electrical and an advice centre. The place was buzzing and you didn’t even need to leave Linwood for anything. There was even a Chinese and an Indian restaurant – places you could sit down in – not takeaways. The town centre struggled on in the the midst of the economic ravages of the Thatcher years but somehow survived. By the end of the nineties, however, it was a mere shadow of its former self although the leaseholder, Ellison & Company from County Durham had attracted tenants for almost every unit in the centre. The chemist and the optician opted to relocate to portacabins. Balmore Properties Ltd. was incorporated in September 2000 and by 2006 was under the control of a sole Director, Dallas Peter Rhodes who owned the full paid-up capital of the company – 2 shares worth £1 each. By 2006, residents were fed up and the local MSP, Wendy Alexander, organised a petition to “Boot out Balmore”. A total of 3100 people signed the petition – full half of the town’s residents. But nobody in Linwood was aware of that. Tesco had come to town and was rescuing their shopping centre from the blight of Balmore. Locals worked enthusiastically with Tesco to develop their plans. Some even appeared in their promotional videos. Then in 2010, the folk of Linwood discovered the truth about what had been going on. Dallas Rhodes’ company Balmore Properties was not an independent retail property company. It was set up as a front on behalf of Tesco. Some commercial property sources will happily claim that this is normal practice, that if owners get wind that a major supermarket chain is sniffing around, the value of the property will double or triple. Fair enough. But if that was the case, Tesco should have revealed its hand in 2001 or 2002. It didn’t. Instead the tenants were driven out and the community was left with a town centre that, later in 2011 would earn them the Carbuncle of the Year award. Dallas Rhodes is and has been a Director of a number of other companies. One of them is Whitecastle Properties Ltd., a company wholly owned by Tesco Stores Ltd again with a paid up share capital of two £1 shares and with Tesco executives as Directors. Rhodes was a Director of this company from 2003 until 2008. The net assets of the company as at February 2012 came to a total of £236. But unlike Balmore Properties Ltd. which never submitted any annual accounts because it enjoyed an exemption as a small company, Whitecastle does submit accounts and thus has to state its purpose. Its 2012 accounts admit that the Company’s principal purpose is “to act as an agent for Tesco”. Tesco town is now well underway and developments can be followed at its website. In the 50 years since the opening of the Hillman Imp plant, Linwood has enjoyed great hopes with the car industry, rapid and brutal decline and, finally, a takeover by a corporate retailer that dishonestly appeared as a knight in shining armour to rescue the townsfolk from their fate. What Linwood has not had, until the establishment of the Linwood Community Development Trust, has been any proper understanding, control or influence over how their town is governed. The work of the Trust has been inspirational as highlighted by this short film made as part of Oxfam Scotland and the Scottish Wave of Change project. It is no substitute, however, for the return of real political and economic power to people. And that is the challenge for all of Scotland’s towns. I have been boycotting Tesco’s since 2005 for a number of reasons. How can you enjoy your food when it’s come from such a despicable company? Tesco! If only I could boycott them but they have a near monopoly here. Sainsburys, Aldi and Lidl are too far away. Now on top of the way they treat their suppliers and customers we get them wheeling and dealing in the property market. No doubt this has tax advantages for them as well.